I can’t begin to tell you how excited I am to share this recipe with y’all. 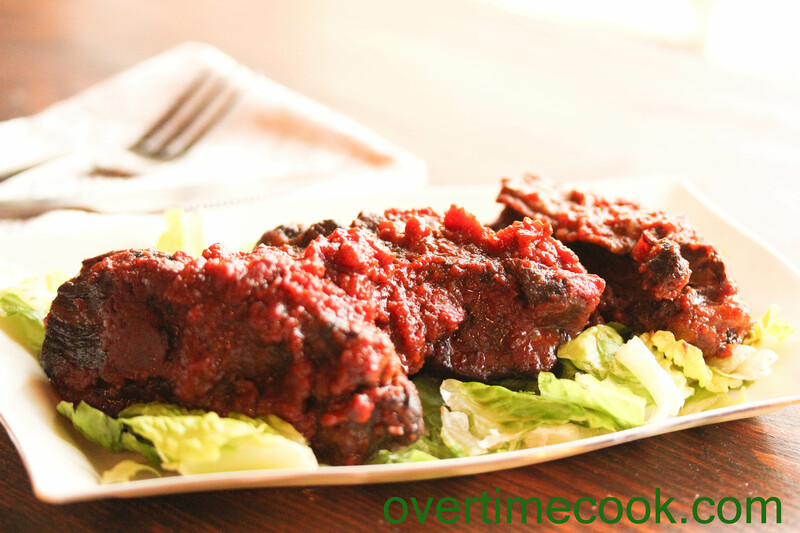 Partly because it’s every bit as mouthwatering, juicy, melt-in-your-mouth, and delightfully messy as a good rib should be. And partly because I made these for my Purim Seudah (party) and they were an absolutely smashing success. There were heaps of good food at this party, courtesy of various family friends and neighbors, but somehow nobody could stop talking about -or eating- these ribs. It’s a good thing, too. I stressed over these ribs for ages. Starting with the sauce. Of course, I couldn’t be content buying a bottle of sauce and pouring it over these ribs. No, I had to make my own. And naturally, after reading (what felt like) millions of recipes, I still hadn’t found one I liked. So I basically made up my own. 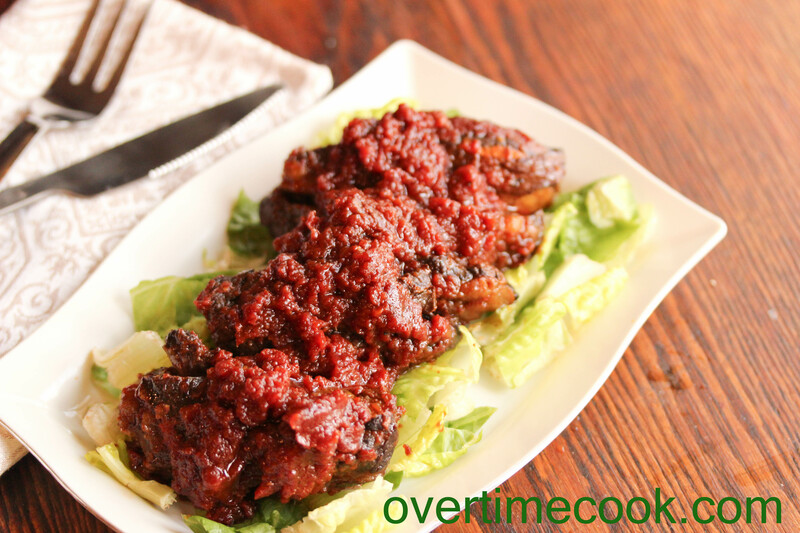 Once I made the sauce, I read (again, what felt like millions of) recipes for ribs until I decided how I would cook these. I like to think all of this work paid off. The ribs were perfect. I would change absolutely nothing. The dieting half of me wants to leave this recipe deep in the depths of my brain, not to be called up until a miracle weightl-loss product is introduced into the world. The good-food-loving half of me wants to eat these every day, for breakfast lunch and supper. * Yeah, they are that good. *The part of me that gets heartburn would like to amend that statement. Lunch and supper would be nice enough, thanks. Oh and the barbecue sauce? It’s the stuff dreams are made of. No kidding. It’s not meant to be used as a dipping sauce, but use this at your next barbecue and everyone present will love you forever. Seriously. Combine all ingredients in the food processor. Process for a minute or two, then turn off food processor and scrape down the sides. Repeat once or twice until all ingredients are completely smooth. Heat oil in a large frying pan or dutch oven. Sprinkle salt and pepper over both sides of ribs. When oil is hot, place ribs in pan over high flame. Turn ribs after a minute or two to brown on the other side. Do not overcrowd the pan. Work in batches, if needed. Ribs should be browned, but still raw inside. Absorb the amazing aroma that permeates the air as they come out, dig in, and of course, enjoy! I know the cooking time wasn’t a typo. The lower the temp and the longer you cook the ribs the more tender they are. 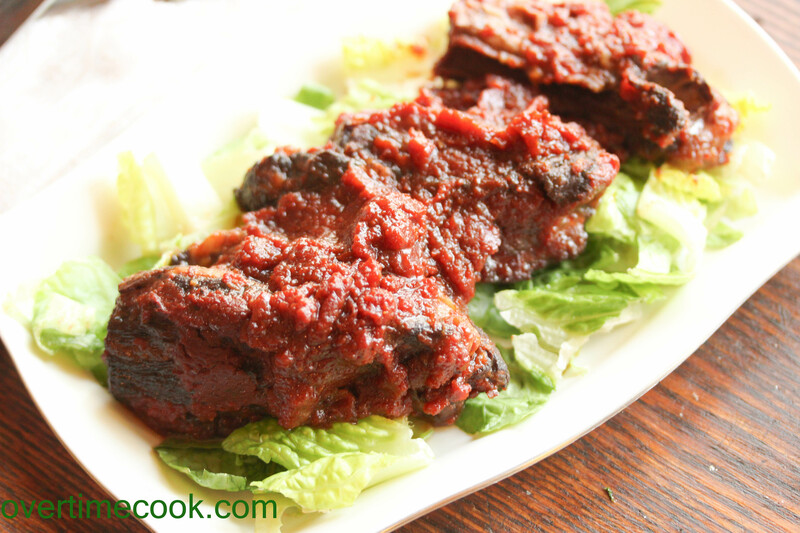 Your ribs looks fantastic as does your own home-made sauce. Not surprising that they were such a big hit at your Purim Seudah. Tali- I am not familiar with that drink. I would guess that other drinks would work, though they might not be as flavorful. Add a little Worcestershire sauce with the whiskey to make up for some of the flavor. Yum! That bourbon bbq sauce sounds scrumptious! Shira, I’ve never frozen these, but because they have a lot of sauce, I would assume they would freeze nicely. If you do freeze them, please comment and let us know so others can benefit! Was it fine? It’s Erev shobbos so I put it on 300 for 4 hours… Hoping for the best! This really recipe looks fantastic!! I can’t wait to try it! If I made the sauce to have on hand, how long do you think it would last in the fridge? Can I use this recipe for pulled brisket? Also I don’t have tomato paste just tomato sauce. Can I sub? Looks amazing! Can I marinate the meat in this sauce and grill it? Will it be as good/soft? Sure! The sauce is delicious in any application! The meat was fall of the bone delicious but the recipe called for way too much sauce could have made a 1/2 and still had left overs. A bit late to the party. I am sure you probably have commented somewhere but how many people would this feed?